UPDATED: Mon., Jan. 28, 2019, 10:52 p.m. There for the first one, Jerry Kramer knows firsthand how expensive Super Bowl tickets have gotten to be. The Super Bowl certainly has ballooned in popularity and price since the first one 52 years ago, in which Kramer, the Sandpoint native and member of the Pro Football Hall of Fame, played for the Green Bay Packers. 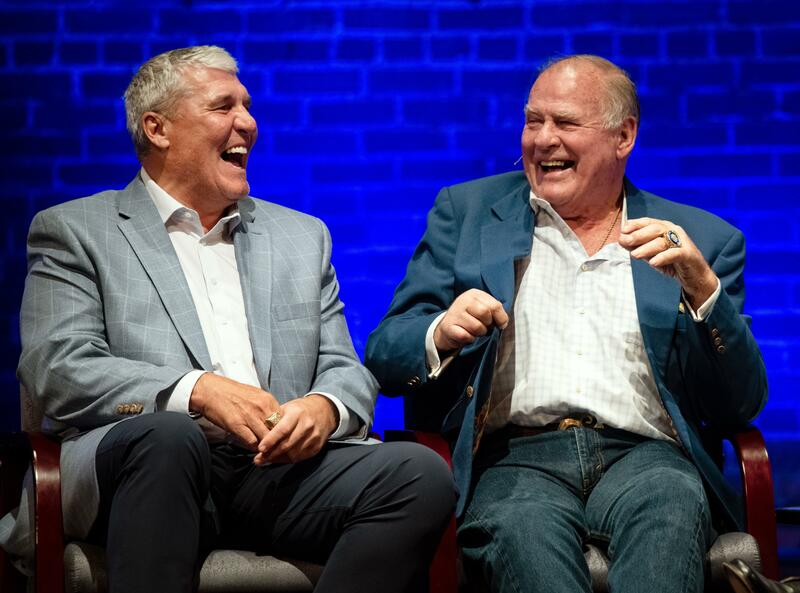 With Mark Rypien, Kramer shared the stage Monday night at the Bing Crosby Theater for “Super Stories,” tales of their Super Bowl appearances and football careers. The event was part of the Northwest Passages Community Forum series and was hosted by The Spokesman-Review and KHQ/SWX. Sam Adams of KHQ and Dave Boling, formerly of The Spokesman-Review, emceed the event. Kramer took the stage first to a standing ovation from an audience comprised of many fans donning gear from the Packers – for whom he played from 1958 to 1968 – and the Idaho Vandals, his college team. He sat down to a “Go, Pack, Go!” cheer. “Does that happen everywhere you go?” Adams asked. “At home, normally,” Kramer quipped. He was later joined by Rypien, the former Washington State quarterback who was part of two Super Bowl-winning teams with the Washington Redskins and was named MVP of Super Bowl XXVI. The two former players spent the rest of the event telling stories of Super Bowl memories, teammates and, especially, their coaches. Kramer played his entire career with the Packers, who were coached by Vince Lombardi, after whom the Super Bowl trophy is named. Kramer went on to talk about a time later when he was at home, moving wood stacks with his 6-year-old son, Jordan. Kramer was moving wheelbarrows of wood and Jordan wasn’t all that keen on the chore, nor was he keeping up with stacking the wood in its new spot – except for two pieces of wood, perfectly placed. Rypien shared a story of one bad half of football, after which Redskins coach Joe Gibbs, met the team in the locker room. They went out and played much better after the half, Rypien said. Rypien also talked about his holdout heading into the 1991 season that culminated in the Super Bowl MVP award, when the quarterback was at Flathead Lake. His preparation for the season, he said, was to stand on a dock and throw footballs to his agent’s son, who would ride past on a boat. Both mentioned a number of their teammates, and many received cheers from the crowd: Max McGee and Paul Hornung came up often for Kramer, Darrell Green for Rypien. As for this Sunday’s Super Bowl between the Los Angeles Rams and New England Patriots, Rypien didn’t reveal his rooting interest. Published: Jan. 28, 2019, 10:22 p.m. Updated: Jan. 28, 2019, 10:52 p.m.